I am moving away from a hamburger menu style app to use tabs. (This article basically summarizes why I want to do it.) However, under one of the tabs I have newsfeed, which has to sections: Current User's & Public. Currently there is a tab on top to switch between the two. I was wondering if there are any good examples of tabs within tabs out there. Or maybe a completely different solution I am not thinking of. Note: I don't want to put the two newsfeed tabs in the main tabs. 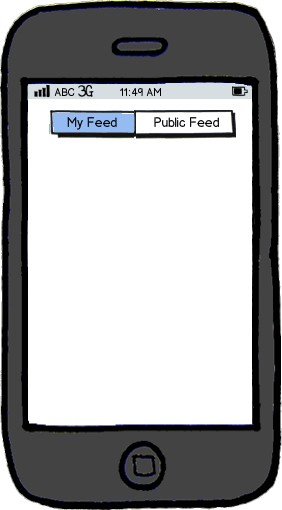 Yik Yak's recent update, known as "My Herd" (formerly basecamp), was implemented using hierarchical tabs. As you can see in the header, users can differentiate between "New" and "Hot", then "Nearby" and "My Herd" below. Although this is an iOS example, I believe it captures the functionality you are looking for. You could just use a different visual metaphor to differentiate the two. Use traditional navigation tabs on the main page, and something like a toggle switch on the feed sub-page. Functionally the same as tabs, but using a toggle will differentiate the two in the mind of the users. In this case, tabs are to get to content, and the toggle is to switch between two views of that content. In some cases, patterns may apply well to a given design problem in theory, but in practice they may break down and cause visual clutter or interactional issues (like your example, if there are two rows of tabs on the screen). If that happens, explore other navigation patterns(like Buttons target or Dashboard pattern), or variations on chosen patterns, to arrive at a more optimal set of sketches. Not the answer you're looking for? Browse other questions tagged navigation android tabs or ask your own question. How to arrange Buttons and Tabs together? Should I combine pages that manage “settings” and “private user information”? Can Tabs also serve as Page Titles?